Status Quo would be keen to make a cameo on Glee if they were invited. 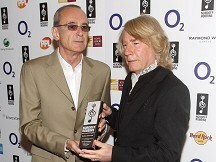 Whatever You Want rockers Rick Parfitt and Francis Rossi, who were honoured at the Nordoff Robbins O2 Silver Clef Awards, have already played themselves in Coronation Street, and would be open to appearing in the hit musical TV show. Rick, 62, said: "We'll do anything really, we've always been like that. If something comes up and it's worthwhile doing, we'll do it." Francis, 62, added: "That means dancing does it? I'd let him dance he's good at that. I could look at him and go wow. He really can dance." But Rick insisted: "No you're the best dancer. He's a wonderful dancer. I've never seen anybody dance as good as him." The rockers said that while they are open to people covering their songs, they don't expect to see any Status Quo songs on The X Factor. Rick said: "Our music is not the kind of thing, I mean there are Quo cover bands around, but I don't think you're going to see any of them on X Factor. And apart from Rocking All Over The World, Whatever You Want, Down Down and various others, I don't know, I've never really seen anybody go on telly and cover any of our songs. "We want them. They're ours." Boy George has hit out at The X Factor, claiming the show would have rejected pop superstar David Bowie. Adele's Someone Like You has become the first single to sell more than a million copies this decade, the Official Charts Company said. Duran Duran have been forced to call off their European summer tour due to frontman Simon Le Bon's ongoing problems with his voice. Fearne Cotton was spotted looking loved up with new man Jesse Wood at the Cornbury Festival in Oxfordshire this weekend. Cee Lo Green has revealed he's been offered a coaching role on the UK version of talent contest The Voice. Katy Perry has tried to get the Duke and Duchess of Cambridge along to one of her concerts during their royal tour of Canada. Jarvis Cocker told the crowd at Wireless Festival in Hyde Park that they were witnessing a "homecoming" gig from Pulp.